being little • bristol uk fashion & lifestyle blog. : the perfect scone. What are you doing this weekend? How about baking a whole bunch of scones, like I did yesterday, and enjoying them with some clotted cream and jam? Cream teas are probably one of my most favourite sweet treats, and after using a couple of different recipes yesterday, I have decided this is the best one.. 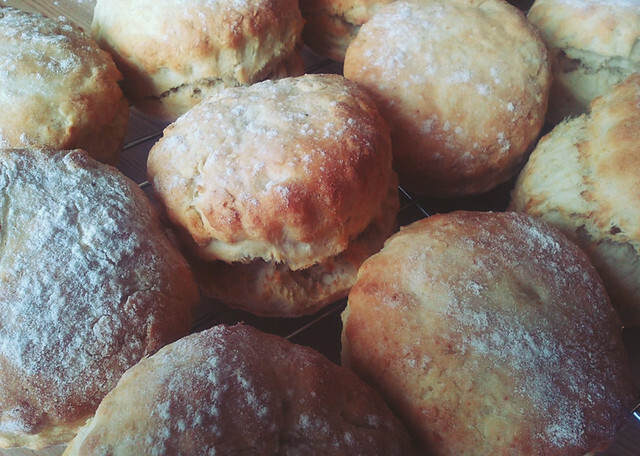 It's a slightly adapted Delia Smith Devonshire Scones recipe.. and this is how it goes. • Pre-heat oven to 220ºC/200ºC fan-assisted and grease a baking tray or two. • Rub the butter into the flour with your fingertips, then stir in the salt. • With a knife, mix in the milk little by little. • Flour your hands and knead slightly to a soft dough. • Place your dough onto a floured surface and roll or press to about 4 or 5cm thick. • Use fluted pastry/cookie cutters to cut out your scones, whatever size you like! Do NOT twist the cutters. • Repeat until you have used all the dough. • Place on baking tray, dust with flour and bake for about 10minutes, or until they rise and turn golden brown. • Transfer them to a wire rack and eat them as soon as they are cool enough! They're lovely when still warm! Let me know if you make any! They're a lovely Sunday afternoon tea treat! Also, there's still time for you to buy a little ad space on Being Little for October! Info here! I wish I could bake, but no. I work next to a Bakery and nothing beats the smell of freshly baked Scones.! wow this looks so so yummy! These look amazing! Baking is so therapeutic. I also love everything you wear <3.